SEVERN TWP. — Provincial police are looking for suspects who stole two ATMs from the same Hwy. 11 business. Police are looking for this suspect in a after a second break and enter Wednesday and ATM theft. The OPP are investigating two separate occurrences of break and enter in Severn Township. On Nov. 30 at 1:55 a.m. a male suspect gained entry to the business by breaking the front door while a second person stood by in a nearby vehicle. A strap was secured around the ATM and the vehicle was utilized to pull it from the business. The suspect is described as approximately six feet tall with a thin build, wearing a light coloured jacket with a fur lined hood, dark pants and wearing gloves. And just five days later, on Dec. 5, at 2:50 a.m., a male suspect gained entry to the same business by removing the glass from the front door while a second person stood by in a nearby vehicle. Again, a strap was secured around the ATM and the vehicle was utilized to pull it from where it was secured. 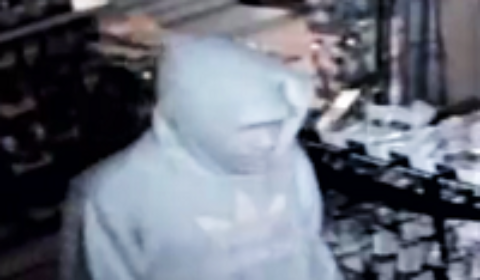 The suspect in this case is described as approximately six feet tall with a thin build, wearing a light coloured Adidas hooded sweatshirt, dark pants and a light coloured toque underneath the hood. It is believed that a pickup truck was used in both incidents to remove and transport the ATMs. Orillia OPP members, with the assistance of Scenes of Crime officers (SOCO) and the Orillia Crime Unit, continue to investigate these incidents. The Orillia OPP are asking that if anyone locates an ATM or if anyone witnessed this incident, or has information that could be useful, to contact the Orillia OPP at 705-326-3536 or 1-888-310-1122. The suspect is described at six feet tall with a hoodie and toque. A suspect is also seen wearing a toque and fur-lined jacket in the first theft last Friday, Nov. 30.